…Though of course, I must admit: when I was first planning my Iceland itinerary, I was a bit skeptical that the hype for it might be just a fluke and I will end up not only disappointed but also broke (besides, it IS famous for being an expensive getaway). Nevertheless, I was thankfully wrong: Iceland is truly worth the hype, the money, and more! Speaking of such ‘hype’, I’m sure you are already aware of this, but Iceland has been constantly hitting headlines and topping bucket lists for years now as it repeatedly gains the favor of its visitors (including me). 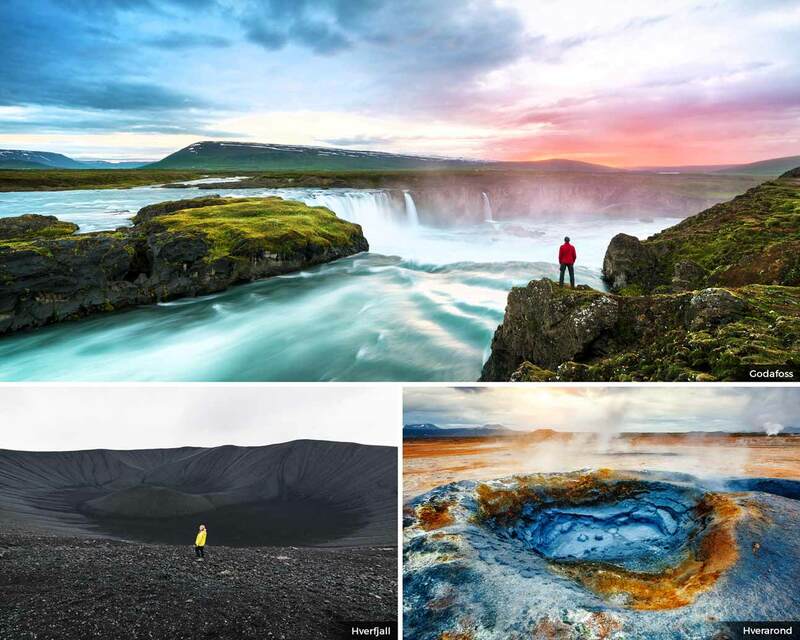 All of that attention is fairly well-placed because even if Iceland is a small Nordic island nation, it is filled to the brim with dramatic landscapes full of hot springs, glaciers, geysers, lava fields and volcanoes among many others. In fact, you can just take one look at the photos and videos online and offline and they will already speak multitudes of its wonders — so imagine how it could be like when you see everything in flesh! With all that said and done, if you’re now bitten by the travel bug and also hoping to make things happen, below is a suggested Iceland itinerary that you can do for 10 days. Anyhow, you can easily tweak the 10-day Iceland itinerary below if you happen to have longer or lesser days ahead, so no worries on that! To find the best deals, check Agoda and Booking.com. But if you’re rather interested in renting comfortable houses or apartments to cook your own food, check AirBnB. When it comes to places to stay in Reykjavik, come and check out my list of the ‘Best Hotels in Reykjavik‘ which features the top recommended choices for cheap to luxurious accommodation choices. The country uses Icelandic króna (ISK) wherein €1 equals to about ISK 104~, USD $1.10~ or Php 60~ (this is as of November 2018). However, most places and shops also accept payment in US dollars, Euro, Canadian dollars, as well as Danish, Norwegian and Swedish currencies. Though if I may point out, most people just pay by card (credit or debit) because most establishments accept it — even taxis. Therefore, it is not totally necessary to carry large amounts of Icelandic currency. But then again, it also helps to have some cash on hand in case of emergencies. So when exchanging your money, I highly advice that you do NOT exchange it at the airport since the rates there are not competitive. So what should you rather do? Either exchange your money at a bank or at a money exchanger in your home country or in the city center of Reykjavik. You can also just withdraw from an ATM with your debit/credit card (but do one big withdrawal to minimize fees with your bank). NOTE: When it comes to tipping, you do NOT have to worry about it because in a sense, gratuity already comes together with the cost that you’ll be paying for. Winter: (December to February) Aside from colder temperatures (that can go as low as -30°C) you must also expect shorter days and some wind chill. It’s great for hunting bright Northern Lights, grabbing the lowest prices and seeing lesser crowds but be wary of the fact that most highland roads can be impassable if not dangerous. ★ Spring: (March to May) Days are now longer and you’ll even get to see greener landscapes with lesser snow. This is one of the best times to visit Iceland given that is ‘shoulder season’ (when prices are still lower and tourists are fewer). Weather will still be erratic at times — but it’s better than winter and you can still catch the Northern Lights until early April. An added bonus are the cute puffins who start to arrive in Iceland around April for their annual nesting. Summer: (June to August) This is the peak season with higher prices and more people — which is no wonder because the weather is mild, the landscapes are at their greenest, and the days are longer, including the Summer Solstice wherein daylight can last for about 21 hours! The Northern Lights start to show in late August too. ★ Autumn: (September to November) You will love Iceland as it is bathed in hues of orange, red and yellow! Temperatures will start to get slightly cooler but there will be fewer crowds with lower prices (as it is also off season). Again, Northern Lights can be seen at this time if you are lucky. If you want a bit of snow that is still ‘comfortable’ for driving, this is a great time to go too; after all, I loved the feeling when I suddenly went through mountain passes that are all clad in white! – Northern Lights in Iceland typically start to show in late August to early April. – Weather is really unpredictable so make sure that you are prepared for the cold and for possible wind chills. – For the most part, temperatures don’t go higher than 20°C in the day. How to go to Iceland? When searching for flights, I highly recommend browsing through Skyscanner to find the best deals from your point of origin. You will find that most flights from key points in Europe will be below $100. If you’re from the Philippines like me, though the cost is mostly at Php 50,000, it is possible to get Php 25,000 roundtrip flights especially if you book during off season. From KEF, you can get to the city center of Reykjavik by bus or taxi. You can also rent a car and there are several shops at the airport where you can purchase one (otherwise, it’s best to book online beforehand and for this I often use RentalCars.com). By bus: Flybus (ISK 2,900), Grayline (ISK 2,500), and Airport Express (ISK 2,100) can drop you off at the Reykjavik bus terminal. They can also bring you directly to your hotel for a higher charge of around ISK 3,000 to 4,000. There’s also a cheaper option by taking the public bus system called as “Strætó”. Just look for bus 55 at the airport’s departures area and they would indicate their stops and arrival times (but it’s often infrequent, so you can check the times online) with the last stop at BSI Umferðarmiðstöðin, which is Reykjavik’s main bus terminal. Tickets cost about ISK 1,800 which you can pay for in the bus or purchase beforehand at the Airport Information Desk. By taxi: Be wary that a metered taxi from the airport can cost about ISK 15,000 so it’s best to ride the bus, get a shared transfer, or get your own rental car. By shared transfer: If you don’t have a rental car, this is the next best thing for you! Check out KKday‘s shared transfer services on this this link. Should I get a visa to visit Iceland? Since Iceland is a part of the Schengen member states, you can check this list of countries to see who does NOT need tourist visas to enter the country. Naturally, if you’re NOT a citizen of any of the listed countries, you will then need to apply for a tourist visa in the Iceland embassy that’s near you. How to get around Iceland? Going around by car currently offers the most flexibility and practicality for travel around Iceland — it’s fairly expensive but it will save you the time and the hassle, as well as give you enough opportunities to control your itinerary and see more sights along the way! If you want to save time, I highly suggest booking your car beforehand. For such, I use RentalCars.com for searching through all the available car rental providers. Otherwise, you can get a rental at the airport itself; but be wary when you’re coming during peak season because the car you want might not be available due to the high number of visitors. Gas stations are easy to find around major towns but they become less frequent (at 100 to 200km apart) as you go on your Ring Road trip. Hence, it’s always advisable to fill up when you can. The gas stations operate 24 hours and are self-service with payments done only by credit card. However, if you have a credit card that does not have a PIN number, you will need to find a gas station that has an attendant so that you can process your payment with them inside. Driving in Iceland is on the right side of the road and it is mandatory to have your headlights on at all times (yes, even during the day). Speed limits on highways are at 90km/h on paved roads and 80km/h on gravel roads. Speaking of gravel roads, there could be parts in the east or north of Iceland where the road suddenly changes into gravel; therefore, please mind your speed at all times to avoid accidents. Take note that there are roads that start with an “F” and those are only for 4×4 vehicles due to its rough dirt paths that often cross rivers and such (they close from October to mid-June); so it’s best to avoid them if you have a different car. Rest assured, the stops I will be mentioning in this Iceland itinerary won’t be making use of F-roads, but if in case your GPS leads you to one, do avoid it (unless again, you have a 4×4 vehicle). There are single-lane bridges on the highways of the Ring Road and whoever is the closest to it has priority when crossing the bridge. If you don’t want to drive, there’s the option of carpooling through websites like Samferda. Naturally, expect that it can be a hit or miss. This is more ideal if you don’t have any time constraints and are not sticking to an itinerary. You can watch this helpful video to learn more about driving in Iceland. By bus.There is no railway system in Iceland but there is a bus system. Take note, however, that they are still quite expensive and infrequent. One popular option with buses is the “Full Circle Passport” which enables you to travel the Ring Road and it costs about ISK 40,000. However, it is often only available in the summer and you have to choose which way you travel (clockwise or counterclockwise) because there is no going back and forth. You can chose from buses like BSI, Gray Line, Discover Iceland, Sterna and Trex. (They also have other unlimited ride and route options). Another option is to just join day tours or sightseeing companies like Gray Line and Reykjavik Sightseeing. Where to find the best Iceland accommodations? To find the best deals, check Agoda and Booking.com. But if you’re rather interested in renting comfortable houses or apartments to cook your own food, check AirBnB. I mostly stayed in AirBnBs during my 10-day Iceland itinerary road trip and it made for great experiences (e.g. I stayed in a cottage in the middle of nowhere with great views, a farm land that had beautiful Icelandic horses, etc.). When you’re in Reykjavik though, come check out my list of the ‘Best Hotels in Reykjavik‘ which features the top recommended choices for cheap to luxurious accommodation choices in the vicinity. What are some practical and money-saving tips I should know of when in Iceland? When it comes to tipping, you do NOT have to worry about it because in a sense, gratuity already comes together with the cost that you’ll be paying for. Most of the meals that they serve in restaurants are big, so it can be a smart move to split it with your friend to save on costs. To further save on food, it’s best to shop for it in supermarkets (NOT convenience stores). For this, look out for the Bónus or Krónan shops because they have considerably lower prices than the other supermarkets. There’s NO need for you to buy water at the store because tap water in Iceland is totally safe and drinkable. If in case you need some added warm layers to your wardrobe, there are good second-hand shops like Red Cross and Salvation Army at Reykjavik’s downtown. When you’re visiting in the summer, don’t forget to bring an eye mask with you for sleeping! After all, there is the Summer Solstice wherein the sun stays up almost 24 hours. Speaking of clothing, it’s always a smart move to pack a wind breaker or a waterproof jacket/raincoat because rain can happen sporadically (not to mention that the waterfalls can get you wet). For a complete packing list, see my post here [coming soon]. If you plan to go camping or if you have a camper van for your Iceland itinerary, there are sites all over the country where you can stay for the night and enjoy fully-equipped facilities (showers, laundry, kitchen, etc.). The cost for this usually spans from ISK 500 to 1,000 a night. Just take note that it can get really cold so pack up on thermal wear and warm sleeping bags. For some peace of mind, other than your GPS, it also helps to have a pocket WiFi on hand. It not only helps you stay connected but it’s also helpful for sharing a connection among you and your friends. For this, I highly recommend Tep Wireless and you can even use my coupon code to get 15% off! On the other hand, you can buy a local SIM card at the airport’s duty free store. It’s always good practice to get travel insurance for your trip, more so when you’re going through a wild place like Iceland. To avail, I would highly recommend World Nomads since they offer the best price and coverage. Recreational drones are still allowed in Iceland without a permit, but you must take note of the rules such as: NO flying it in areas where there is a no-fly drone sign, NO flying beyond 130 meters, and NO flying near airports, crowds of people, and government buildings. There are two kinds of plugs/sockets in Icelad: C and F. Plug type C is the plug which has two round pins and plug type F is the plug which has two round pins, with two earth clips on the side. 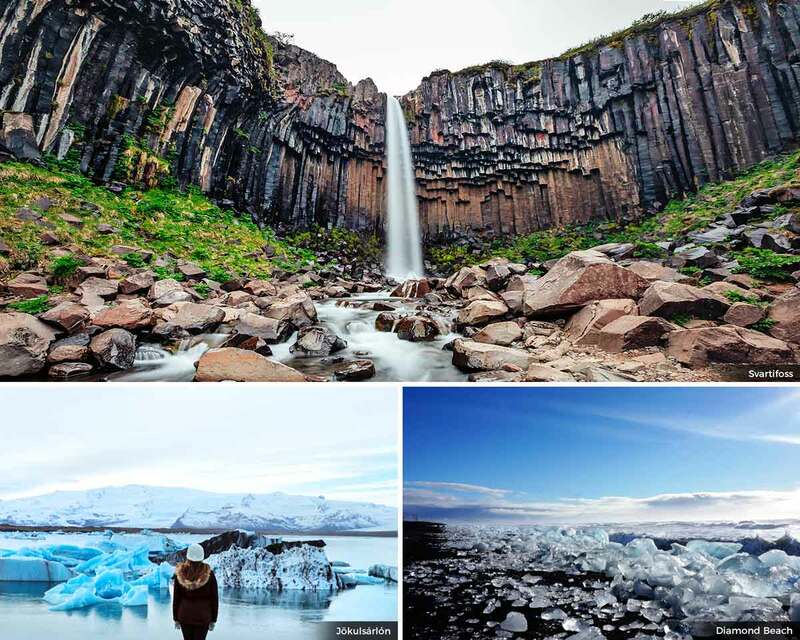 Aside from using my Iceland itinerary guide below, you can also browse through Trover to search for some inspiration as well as see what other hidden gems you can find in the country! Must-try Icelandic food and drinks? Any Icelandic fish like Haddock, Halibut, Atlantic salmon, brown trout and more. Icelandic is the national language but most of the locals can speak English (and even Danish) given that both are compulsory to be learned in schools. Anyhow, it always helps to know an Icelandic phrase or two! Also, ‘Day 1’ is a full day so it does NOT take into consideration your flight arrival. As such, please plan accordingly. Also, I made the Iceland itinerary below into 10 days because I deem it as the most optimal time for exploring the famous “Ring Road” (Route 1) — which is basically the main road that goes all around the island at about 1,300 kilometres. Technically, you can drive the whole of this Ring Road in just less than 24 hours; but, in order to see all the key spots, you need at least a week. In order to have some ample time, 10 days is the most optimal. Of course, if you can stay longer, the better it will be and you can easily tweak the itinerary below if you have longer days (if not shorter). 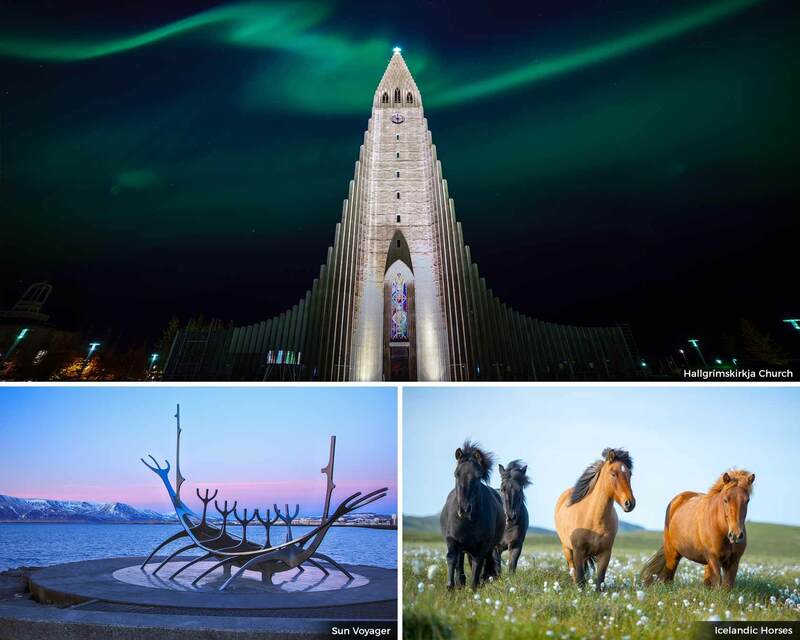 Jumpstart your Iceland itinerary in the vibrant capital of Reykjavik! Some key places that you must NOT miss out for your Iceland itinerary’s first day are the following. Unfortunately, it will NOT be possible to see everything below in one day so choose wisely! Árbæjarsafn. This is a historical open-air museum that aims to give some insight into the living conditions of the people of Reykjavik back in the earlier times. (NOTE: Opens from June to August only). City Hall and Tjörnin (The Pond). Just north of the lake Tjornin is this modern glass building which is a great example of late 20th century in Iceland. The surroundings also serve as a tranquil oasis for doing picnics (weather permitting) and for admiring the scenery. ★ Hallgrímskirkja Church. This is an iconic Lutheran parish church in the capital that rises at a height of 74.5 meters and you will love its unique design. It is possible to go inside for free but if you want great panoramic views, it is possible to climb the tower but you will have to do so for a fee of ISK 700. Harpa Concert Hall. Yet another architectural wonder, this concert hall and conference center has a distinctive colored glass facade and it serves as the home of the Icelandic Symphony Orchestra. ★ Hunt for the Northern Lights or Aurora Borealis. Iceland is one of the best places in the world to sight the Northern Lights. There are various tours that offer this kind of activity but if you have a car, it’s possible to hunt for them on your own by going to the seaside at Seltjarnarnes or around the area of Grótta wherein you’ll be far away from the city’s lights. If you’re lucky though, you can already spot Northern Lights in downtown Reykjavik — most especially when November starts. Just remember that the season for it starts late August up to early April. From August to October though, you might need to stay out a bit later than usual to view them. A good site for checking if chances of the Northern Lights are high for the day is through the Icelandic Met Office. NOTE: If you rather want a guided tour for hunting the Northern Lights, check here. ★ Horse riding. Apparently, the Icelandic horse which is known for its pony-like stature and long mane is the only breed in the country so it is strictly regulated. Not only are they forbidden to be imported but if by chance they are, they’re not allowed to return. For a memorable experience, it is possible to do horseback riding tours or lessons in the outskirts of Reykjavik with providers like Extreme Iceland and Guide to Iceland. Icelandic Phallological Museum. This might be a bit of an odd suggestion but it’s quite a unique spot. As the name suggests, this is a museum that features penises and penile parts of different animals such as whales, seals, and others. (TRIVIA: It’s the worlds largest display for this kind of things). Saga Museum. This is a waxwork Viking museum that depicts the key moments in Icelandic history. As you go through the museum, there are audio guides available in several languages and you can even put on some Viking costumes. ★ Sun Voyager. Found near Sæbraut road, this is a sculpture made by Jón Gunnar Árnason representing a dreamboat that’s said to convey the promise of undiscovered territory. This usually serves as a great photo spot especially during sunrises and sunsets — more so when there happens to be Northern Lights in the sky. ★ Swimming pools. Iceland is famous for its natural geothermal hot springs and there are several places where you can enjoy such Icelandic pools such as hot tubs, play areas, swimming pools and saunas. Some of the most popular places that locals go to are Sundhöll Reykjavíkur and Laugardalslaug pool. One thing you must just be aware of though is that before you can soak in the waters, you are required to take a shower which often involves showering naked amidst others (a way that’s somewhat similar to the onsens in Japan). Anyhow, once you’re done washing, you can then put on your swimsuit and enjoy the pools. (NOTE: The famous Blue Lagoon is NOT natural as its waters are from a local power station; so most of the time, you won’t find locals in there). Visit green spaces. There are numerous parks and gardens in the city including Grótta, Hallargarður, Hljómskálagarður, the City Hall (as previously mentioned), as well as Klambratún or Miklatún. ★ Whale Watching. Reykjavik is a great place for seeing whales because from April to September, more than 20 species can be spotted by the bay. The best time for spotting whales is said to be during the summer from June to August with a success rate of over 95%. During this ordeal, it’s also possible to witness dolphins, puffins and seals! ★ …Or just walk around! The capital can be easily explored by foot and I loved walking through Old Reykjavik’s colorful houses and lush gardens. If you’re up for shopping, don’t forget to drop by Laugavegur as well as Bankastræti, Austurstræti, Lækjargata, and Skólavörðustígur. TRIVIA: You will find street names in the city that stem from Nordic Religion such as Freya’s Street (Freyjugata), Loki’s Path (Lokastígur), Thor’s Street (Þórsgata) and many others! “Should I go to the Blue Lagoon on this 1st day?” Sure, if you really want to! HOWEVER, I suggest that you do it at the end of your Iceland itinerary (so I’ll be featuring it on tab ‘Day #10’). You might be wondering: why at the end? Well aside from the fact that it’s far from the city center and nearer to the airport, I think you will love how relaxed you would feel when you end your whole Ring Road trip by soaking in its healing waters to wash away all your fatigue. I just really think that it’s fitting, and when I did this, I was so ready to hop on my flight and sleep soundly! – Spend the night today in Reykjavik. You can see this list for the best accommodations or places to stay in. – Check out the list of Icelandic dishes that I listed under the ‘Pre-Travel Guide‘ above so that you can take note of the food and drinks that you need to try while in Reykjavik. If you’ve got some time, check by Bæjarins Beztu Pylsur to taste their famous hotdogs! Some other top restaurants you can try are Grillmarkadurinn, Fiskfelagid, Kopar or Dill. – Make sure that you have your pocket WiFi or SIM card working, if not your car’s GPS. – Like I’ve said for multiple times already, given that Iceland is an expensive country, it’s a wise choice to buy and cook your own food so make sure that you do your grocery shopping today. – It’s also best to buy an emergency lunch pack in case you can’t find a restaurant during tomorrow’s road trip. Start the Ring Road trip! 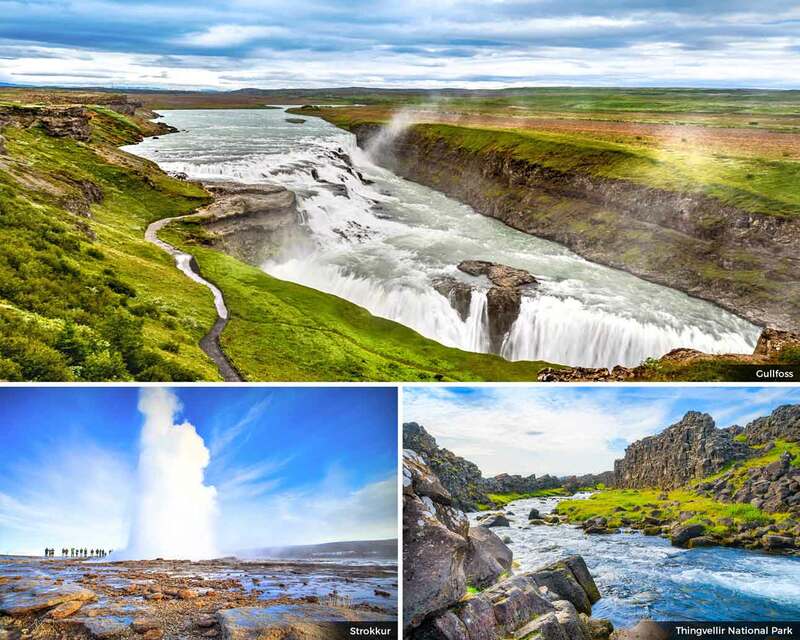 It is possible to do the Golden Circle today (a popular short tourist route looping from Reykjavik and back) but it’s preferable to do it in the last days of your Iceland itinerary together with the Blue Lagoon stopover. So for today, I recommend that you start your Ring Road trip instead to the south with your final destination as the seafront village of Vík. During this journey, below are some stopovers that you can make. TRIVIA: Did you know that there are over 10,000 waterfalls (foss) in Iceland? Due to its north Atlantic climate and Arctic location, it experiences frequent rain and snow so there are large glaciers that feed the rivers when the warmer days come. All of these factors then result to the country’s large amount of waterfalls! Seljalandsfoss Waterfall. This will be your first introduction to Iceland’s grand waterfalls and I’m sure you won’t be disappointed! As one of the country’s most famous ‘foss‘, it has a drop of 60 meters. Plus, it is the kind of waterfall that can be fully encircled, meaning that you can walk in front and behind it. Whenever you start to feel cold, don’t worry, there’s a nearby stall that sells hot coffee and chocolate. There are also free toilets for your use. NOTE: Don’t forget to put on a waterproof jacket or raincoat because the strength of the waterfall is quite strong and you can get really wet from its mist. There is also a nearby waterfall called Gljúfrabúi that you can check out in case you want to avoid the crowds. ★ Skógafoss Waterfall. This is one of Iceland’s biggest and most beautiful waterfalls with a width of 25 meters and a drop of 60 meters. When I first saw it, I was absolutely in awe and it became even more of a beaut when I walked closer to it (be prepared to get drenched!). If the conditions are right, you can even see a huge rainbow in front of Skogafoss! But before leaving this spot, don’t forget to climb the staircase beside the waterfalls for a different kind of view. Solheimasandur Plane Crash. Ever seen those Instagram photos where people stand on top of a plane wreck in Iceland? Well this is that spot. Back in 1973, this US Navy DC plane crashed on the beach of Sólheimasandur. Everyone survived but the remains of the aircraft are still left on this black sand beach which now makes for an epic spot to shoot in. There used to be a time wherein you’re allowed to drive to this DC plane but it is now forbidden to do so. Nowadays, you need to park your car in the designated parking area and then walk up to it — which is an 8km walk (roundtrip). It can take a while so I would only propose that you do this if you have the time and if the weather is good. Dyrhólaey. This used to be called as ‘Cape Portland’ and it is a small yet picturesque promontory or a high point of the land on road 218. You can drive all the way to it (to reach the lower part) or make a right turn on the hill (to reach the higher part). Please just note that this spot can have limited access in spring or summer time. ★ Reynisfjara Black Sand Beach. When I first viewed these basalt rock columns, I found it hard to believe that they are NOT man-made — so yes, it is all the work of mother nature! Found on the black sand beach of Reynisfjara, its unique rock cliff is called as Gardar (NOT Reynisdrangar which are the basalt cliffs found in the near distance of the same shore and which have also been featured on Game of Thrones). Accordingly, these basalt rock columns were shaped when the lava that fell down from the Reynisfjall mountain cooled and contracted at a slow rate. It’s quite tough to imagine how but when you think about it, nature sure is amazing! » Hike Sólheimajökull Glacier. Found near Solheimasandur Plane Crash, this is an outlet glacier of the icecap of Mýrdalsjökull and there are regular guided glacier walks that are being done here by providers like KKday. » Do the Fimmvörðuháls pass hiking route. Located on the east of Skogafoss, this 22km trail is one of Iceland’s most famed hikes since it takes you along Skógá river, between two glaciers (Mýrdalsjökull and Eyjafjallajökull) and into Þórsmörk valley. – Spend the night today in Vik. You can check by Agoda or Booking.com for the best accommodations or places to stay in. Otherwise, look into AirBnB for cheaper options. – Like I’ve said for multiple times already, given that Iceland is an expensive country, it’s a wise choice to buy and cook your own food; so go and make sure that you still have enough groceries. – Check your gas. If you’re not up for refilling your tank, make sure to take note of tomorrow’s route to see if there are gas stations on the way. Fjaðrárgljúfur Canyon. This is an impressive canyon that is about 100 meters deep and 2 kilometers long. With sheer walls and a narrow serpentine cavern, it will amaze you to know that Fjaðrárgljúfur’s bedrock is mostly from the Ice Age so it’s about 2 million years old! To date, flying a drone is still allowed here so it will make for some great footage too. ★ Svartifoss. Found within Skaftafell Nature Reserve, this is a waterfall that is quite unique and elegant because of its surrounding black columnar basalt formations. You will need to hike a bit to get to Svartifoss and it spans a length of 1.5km (about 90min roundtrip) involving some uphill climbs — nevertheless, it will be worth the walk because there are also some other smaller waterfalls that you will see along the way. TRIVIA: This waterfall actually inspired the architect who made the Hallgrímskirkja church in Reykjavik! NOTE: Also, if you want to witness the tallest waterfall in Iceland (at 228 meters), you will find that it’s just near this spot and it’s called as Morsárfoss. Unfortunately, it’s quite difficult to reach since you will need to hike over a moving glacier. It is still possible to reach but you will need a local guide for it. ★ Jökulsárlón Glacier Lagoon. This is a beautiful glacial lagoon in which its blue waters are dotted with icebergs of all sizes (that actually hail from the nearby Breiðamerkurjökull Glacier). Other than taking spectacular photos here, you can also join boat or zodiac tours from April to October, or go ice caving within the Vatnajökull or Breiðamerkurjökull glacier from November to March with providers like Guide to Iceland. TRIVIA: You can witness seals year-round, but you can find hundreds of them here in the winter! Additionally, a number of films have been shot in and around Jokulsarlon such as Tomb Raider, Batman Begins, Interstellar and James Bond movies too. Diamond Beach. Located just on the other side of the road opposite Jökulsárlón. This is basically a black sand beach in which smaller chunks of icebergs from Jokulsarlon glacier would wash up ashore. This would then make for a dazzling view, making it a favorite among photographers. – Spend the night today in Hofn. You can check by Agoda or Booking.com for the best accommodations or places to stay in. Otherwise, look into AirBnB for cheaper options. ★ Stokksnes Peninsula. The Stokksnes peninsula is one of Iceland’s first settlements and its a tranquil landscape that features one of the most breathtaking mountains in Iceland: Vestrahorn. Towering at 454 meters and surrounded by a stunning lagoon and black sand beaches, it will surely make for a good photography spot. Búlandstindur. A beautifully shaped mountain with a pyramid-like form that towers at 1,069 meters between the bays of Berufjörður and Hamarsfjörður. ★ Folaldafoss. This is the lowest of the multitude of waterfalls along Berufjarðará, which runs along Route 939 that climbs over Oxi Pass (a shortcut that saves you 60km between Höfn and Egilsstaðir when doing the Ring Road). I absolutely loved going through this pass and my companion and I even had our lunch by the parking area beside Folaldafoss which made for a great stopover! NOTE: Since the Oxi Pass is a mountain pass, take note that you’ll be driving through a gravel mountain road which is often clad in snow and/or fog. It’s best to avoid this shortcut when the weather is bad; but thankfully, the weather that I had during my visit to Iceland was great so I had the chance to go through this pass. Mind you, it was extremely magical especially when the snow started to fall! Just be cautious though because the road can get steep ,if not narrow — either way, even if I’m not much of an experienced driver, I found it relatively comfortable to drive through. ★ Seyðisfjörður. If you’ve got the time, I highly recommend going through another snowy mountain pass near Egilsstadir to visit this charming little fjord town since it makes for a great scenic place to unwind! I absolutely loved every part of it, most especially their famous ‘rainbow street’ near the Blue Church that was apparently made for the town’s Queer Parade. TIP: Along the road to or from Seyðisfjörður is Gufufoss which is the largest waterfall in the area. » Hengifoss Waterfall. If you’re still not tired of chasing waterfalls in your Iceland itinerary, you can visit Hengifoss which is the 3rd highest waterfall in Iceland! Please just note that it takes an hour (one-way) to get to the falls but it will definitely be worth it! (Nearby you will also find Lagarfljót lake and Hallormsstaðarskógur forest). – During Northern Lights season, this area is famous for showing a lot of activity; so if you’re up for it, I recommend doing some random night driving to spot some Aurora Borealis. – Spend the night today in Egilsstadir. You can check by Agoda or Booking.com for the best accommodations or places to stay in. Otherwise, look into AirBnB for cheaper options. ★ Dettifoss. Within Vatnajökull National Park is this reputed waterfall that’s said to be the most powerful in Europe. Its thunderous falls plummets 45 meters down into the canyon and it’s quite a sight! Not to mention that reaching this spot will be quite a scenic ride because you’ll be passing by a long snowy mountain road. NOTE: This spot can be easily accessed from the east and west side of the Jökulsárgljúfur canyon wherein you can choose either road 864 (gravel road) or road 862 (paved until the parking spot of Dettifoss). Obviously, 862 is the better option. Moreover, within Jökulsárgljúfur canyon you can find other waterfalls like Selfossa and Hafragilsfoss. ★ Myvatn. This volcanic lake that was formed during a massive eruption 2,300 years ago is a popular stopover in the north of Iceland due to the number of surrounding sites that it has. Namafjall Geothermal Area. Found at the foot of this volcanic mountain is a huge area of hot springs called as Hveraröndor Hverir. This area is quite famous due to its sulphurous boiling mud springs (called solfataras) and steam springs (called fumaroles). It can get quite smelly here but you’ll definitely be in awe with its gigantic mud craters and huge fumes. Please just remember to stay on the track because if you don’t, you will be at the risk of getting too close to the boiling soil or hot fumes. Hverfell or Hverfjall. This is one of the largest explosion craters in the world with a diameter of 1,000 meters and depth of 140 meters. The rim of this volcano is accessible by two paths so you an walk up and encircle it. Myvatn Nature Baths. This place is similar to the famous Blue Lagoon given its geothermal heated pools as well as man-made steam baths and lagoons. It’s quite cheaper too, but if I have to choose between the two, I’d pick the Blue Lagoon for its size and amenities. Nevertheless, if you want a smaller and cheaper option with lesser crowd, this is a good option. Godafoss. This is the 4th largest waterfall in Iceland with a height of 12 meters and a width of 30 meters. Its name either means waterfall of the gods or waterfall of the ‘godi’ (priest/chieftain) which is quite well-fitting because it is a beauty. As such, it’s a worthy stopover for your Iceland itinerary. Ásbyrgi. Found further north is this glacial canyon which is unique for its horseshoe-shaped depression. NOTE: Nearby is is a distinctive cluster of columnar rock formations that stand at tte entrance to Vesturdalur (a lush mountainous valley) and it’s called as Hljóðaklettar. Húsavík. A town on the north coast which is famous not only for its wooden church of Húsavíkurkirkja but also for its whale watching opportunities that is considered to be one of the best in Europe. Akureyri Church. Built in 1940, it has fascianting stained-glass windows that portray scenes from Icelandic Christian history. Akureyri Botanical Garden. This is a great spot in the spring given its wide variety of both Icelandic and foreign flora. Jólagarðurinn. Only a 10-minute drive from the town is this adorable store that resembles a holiday cookie house. It sells Christmas decorations from all over the world alongside traditional Icelandic Christmas items. Other than shopping, it’s a great place for taking photos if not an excellent spot for a picnic. (TIP: Don’t forget to climb up its fairytale tower to see the world’s biggest Christmas calendar). Laufas Turf Houses. Also called as Laufas Museum, it’s a great exhibition that shows prototypes of Iceland’s old architectural heritage: the turf houses. These structures were made to withstand difficult climate while offering superior insulation. Whale watching. Akureyri is also a great place to do whale watching with the season spanning from June to October. » Holuhraun. This is a large lava field created by fissure eruptions so there are always ongoing volcanic eruptions all over. If you’re up for it, it’s possible to go on a sightseeing flight over this eruption area. » Laugar. If you’re up for a leisurely soak, check out the swimming pool of this town. – Spend the night today in Akureyri. You can check by Agoda or Booking.com for the best accommodations or places to stay in. Otherwise, look into AirBnB for cheaper options. The drive from Akureyri to Arnarstapi will take more or less 6 hours but there will be some great stops along the way that will make your Iceland itinerary even more memorable! NOTE: The road that leads to Arnarstapi will mostly be a gravel road with sections that are dotted with potholes so please drive with care. Siglufjörður. This is a bit out of the way, so I only suggest stopping to this picturesque fishing town if you have more days or time in Iceland. In early July, it holds its annual Folk Music Festival which makes for a grat place to be in if you want to experience a bit more of the culture and celebrations in the country. Vatnsdalshólar. These are basically a cluster of hills of different sizes that are believed to have been formed after a catastrophic landslide. ★ Eiríksstaðir. This is one of the most historic sites in Iceland where you can go back in time to witness the Viking Era and it’s basically the home of the infamous Viking ‘Erik the Red’ who is the father of ‘Leif the Lucy’ — the 1st European to sail to North America. You will also find here a hypothesis Viking longhouse of the old Saga Age. NOTE: Saga Age is a period in Icelandic history in which majority of the sagas are set — or narratives about ancient Nordic history and early Viking voyages. Súgandisey Cliff. This is a small basalt island that is accessible from the harbour. Once you reach this point’s lighthouse, you’ll have a wonderful panorama of the town, the sea and the mountains. NOTE: Nearby is Stykkishólmur, a scenic harbour town. » Dynjandi. An awe-inspiring series of waterfalls that have a height of 100 meters. Unfortunately, it’s far up to the north so I only recommend doing this stopover if you have more days to fill. – Spend the tonight and tomorrow in Arnarstapi (so 2 nights in total). You can check by Agoda or Booking.com for the best accommodations or places to stay in. Otherwise, look into AirBnB for cheaper options. – Like I’ve said for multiple times already, given that Iceland is an expensive country, it’s a wise choice to buy and cook your own food; so always make sure that you still have enough groceries. The Snæfellsnes Peninsula is a region in western Iceland known for its dramatic landscapes; so while you’re in Arnarstapi, thsi is the perfect opportunity to see its sights. Bárður Snæfellsás. This is a huge stone structure made by an Icelandic sculptor that’s said to depict Bárður Snæfellsás, a half troll, half man character of local legends. Gatklettur Arch Rock. From the rock statue there will be some coastline paths that you can take and if you take the left, it will lead you to this popular naturally formed stone arch that a lot of photographers love for being the subject of their images. TIP: There is also a stone arch nearby in which you can walk on top of it. To reach it, you just need to find the white Arnarstapaviti lighthouse. Hellnar. This is NOT in Arnarstapi but I mentioned it here because if you follow the coastline paths, it’s possible to do a small hike that will lead to the village of Hellnar that is 2 kilometers away. The walk is great and well marked with several beautiful basalt formations and ocean views. Mt. Stapafell. A beautiful volcanic mountain near Arnarstapi. Londrangar. These are a pair of magnificent rock pinnacles that have been formed through erosion and they protrude from the coast like castles in the sea. Dritvík & Djúpalónssandur. These are beautiful pebbled beaches with some parts of a shipwreck still lying on its sand. TRIVIA: In Djúpalónssandur, there are 4 lifting stones there that were traditionally used by fishermen to test their strength. Snæfellsjökull National Park. An area that’s home to the sub-glacial volcano of Snæfellsjökull. Other things that you can find in the park are Buðahraun lava fields and waterfalls. NOTE: Places like Londrangar and Djupalonssandur are part of the park. ★ Mt. Kirkjufell & Kirkjufellsfoss. Rising at 463 meters, Mt. 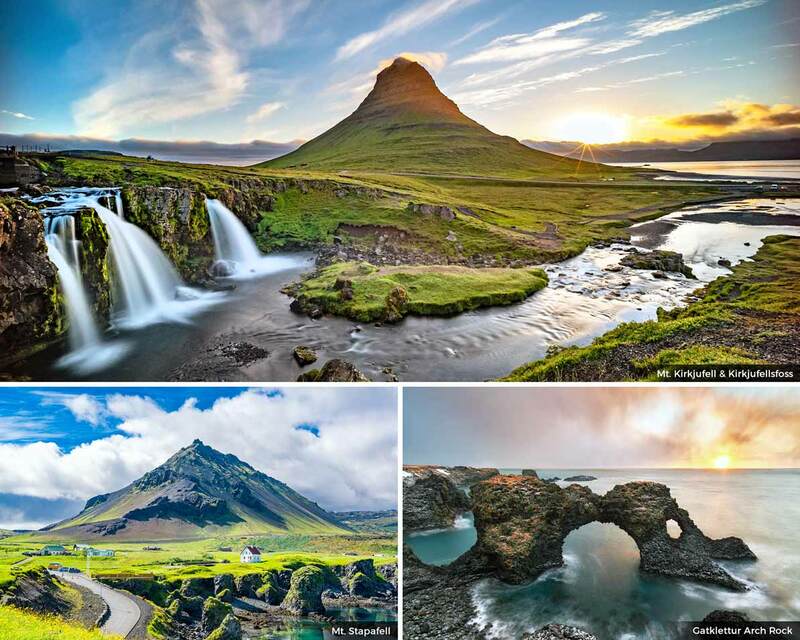 Kirkjufell is a prominent mountain in Snaefellsnes peninsula that perfectly backdrops Kirkjufellsfoss waterfall. You should never miss out this stop while in the area because it’s truly an incredible place. Grundarfjörður. If you have time to spare after visiting Kirkjufellsfoss, you can view this charming fishing town. We’re nearing the end of this Iceland itinerary’s Ring Road trip as we make our way back to the capital today. But like always, there are great spots to see nonetheless! Hraunfossar. If you want to add more waterfalls on your list, this one is unique due to how it is formed by a series of rivulets (small streams) that flow out of a lava field called as Hallmundarhraun. Sometimes the waters will even look either clear turquoise or milky white. NOTE: Barnafoss or Bjarnafoss is also found near Hraunfossar and it is also different given that it’s somewhat a rapid waterfall. Glymur. With a cascade of 198 meters, this is the 2nd highest waterfall in the whole of Iceland (with the first being Morsarfoss). Getting here is a bit of a hike though since it can take you about 4 hours (roundtrip). Akranes Ship Ruin. If you’re someone who wants some more interesting photo subjects, this oldest steel ship in Iceland that has been beached for years in Akranes can be worth a stopover on your Iceland itinerary. ★ Gerðuberg. This is a bit similar to the basalt rock columns in Reynisfjara beach but bigger; after all, this cliff has some amazing geometric patterns on it! » If you end up arriving early in Reykjavik and are in need of some activities to fill up the time, you can do activities that you haven’t been able to do on Day #1 and #2. – Spend the next nights in Reykjavik (so 2 nights in total, in which I will regard Day #10 as the departure date). You can see this list for the best accommodations or places to stay in the city. Otherwise, look into AirBnB for other options. – Like I’ve said for multiple times already, given that Iceland is an expensive country, it’s a wise choice to buy and cook your own food; so always make sure that you still have enough groceries. Otherwise, you can enjoy the top Reykjavik restaurants such as Grillmarkadurinn, Fiskfelagid, Kopar or Dill. It’s finally the time for you to visit the Golden Circle which, as I’ve mentioned previously, is a popular tourist route that spans for 300 kilometers as it loops from Reykjavik into the southern area and back. Þingvellir National Park. This is said to be the only UNESCO World Heritage Site on the Icelandic mainland and it’s mainly because it is where the historical Althing was held: an open air assembly established in 930 A.D. until 1798. NOTE: This is also a rift valley where the North American & Eurasian tectonic plates are slowly separating from each other. Because of this, there are deep fissures in the ground, one of which is called Silfra where a lot of visitors go snorkelling or scuba diving. Laugarvatn Fontana. If you happen to have lost the chance to book a spot at the Blue Lagoon or if you simply want a place that has less of a crowd, this spa center with natural hot springs can be a good alternative. In here, you can enjoy their steam baths, geothermal pools and more. ★ Haukadalur. This is a valley in Iceland that is home to hot springs, mud pots, fumaroles and geysers — including the famous geysers called Geysir and Strokkur. In fact, did you know that the term “geyser” was derived from ‘Geysir’? Nowadays, unfortunately, Geysir no longer erupts but Strokkur is still constantly exploding hot water at 100 feet into the air every 10 minutes or so. ★ Gullfoss Waterfall. Also called as the ‘Golden Falls’, this is one of the country’s most iconic waterfalls and it’s no wonder given its size and power. NOTE: Langjökull is the 2nd largest ice cap glacier in Iceland and it is possible to explore it by foot, jeep or snowmobile. I would highly recommend doing a snowmobile tour when you’re already in Gullfoss because the tour’s starting point is usually done from here. Not too far from this is Viðgelmir which is the largest lava tube in Iceland at 5,200 feet and it’s extremely popular for caving tours. Skálholt Cathedral. Skalholt was the center of Christianity in Iceland and its very first bishop settled in this town. Today, apart from the beautiful church, you will also find a museum and a sarcophagus in the area. Kerid Crater Lake. This is a stunning red volcanic crater lake on the Golden Circle. (NOTE: Therei s an ISK 400 entrance fee and this is to help preserve the crater which is on privately owned land). The Geothermal Energy Exhibition. If you’re interested, this is an interactive museum that aims to show how geothermal energy is harnessed in the island. Like what I have already stated before, I’m suggesting that you do the visit to the Blue Lagoon today in the early morning because aside from the fact that it’s nearer to the airport, I think you will love how relaxed you would feel when you end this whole Ring Road trip by soaking in its healing waters to wash away all your fatigue. I just really think that it’s fitting, and when I personally did this, I was so ready to hop on my flight and sleep soundly! ★ Blue Lagoon. This luxury spa in Iceland has been a hit for years now and for good reason. I have come to visit this place myself and I definitely think that the price is worth it due not only to its facilities but also to its mineral rich waters that has silica (which is good for your skin)! Entrance fee for adults is around ISK 7,000; for a hassle-free experience, book here. TIP: Try to secure a spot in the early morning in order to avoid the crowd, as well as to get the best lighting. Otherwise, visiting late at night is great too in order to enjoy the midnight sun in the summer or the Northern Lights in its season. For more tips about the Blue Lagoon, you can read this article [coming soon]. Garður. If you still have some time before your flight, this town that’s on the very tip of the peninsula provides magnificent sea views and two picturesque lighthouses. – Don’t forget to fill up your gas tank when returning your rental car today at the airport. – If you only have 10 days, I recommend getting a late flight out for this departure date so that you can have enough time to enjoy the Blue Lagoon. I dearly hope that this Iceland itinerary will help you make the most of your Ring Road trip! Of course there is still so much to see in Iceland (there are over 10,000 magnificent waterfalls after all) — but I believe that my travel guide here is a pretty good start. Now, please feel free to tweak this itinerary and make full use of my extra activity suggestions in order to make your trip shorter or longer and better fitting for your travel style. What do you think of this Iceland itinerary? What would you love to see the most? Or have you done the Ring Road before? How was it? Any other tips to add? 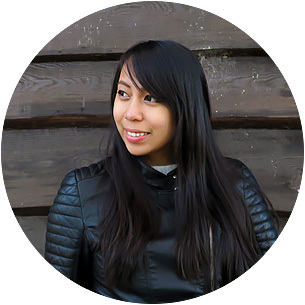 Thank you for sharing Aileen! I hope to also one day visit Iceland, definitely on my bucket list. Although I do live in Canada where the climate and landscape is similar so I don't feel like I'm missing out a whole lot LOL! Haha, but I think the terrain is really different than that of Canada. I hope you get to visit soon!